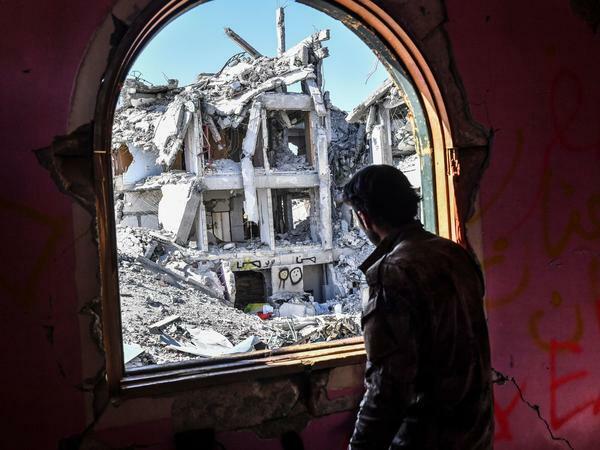 A member of the Syrian Democratic Forces, the rebel group backed by the U.S.-led coalition, looks out upon the ruins of Raqqa last October, toward the end of the coalition's campaign to dislodge the Islamic State from its former stronghold. Smoke billows into the sky following a coalition air strike last July, just one month after the U.S.-led forces began their final push into the city Islamic State once considered its capital. Syrians walk along a destroyed street in Raqqa in February. Exactly one year ago Wednesday, rebel forces backed by the U.S. embarked on a last, massive campaign to dislodge the Islamic State from its de facto capital in Raqqa, Syria. 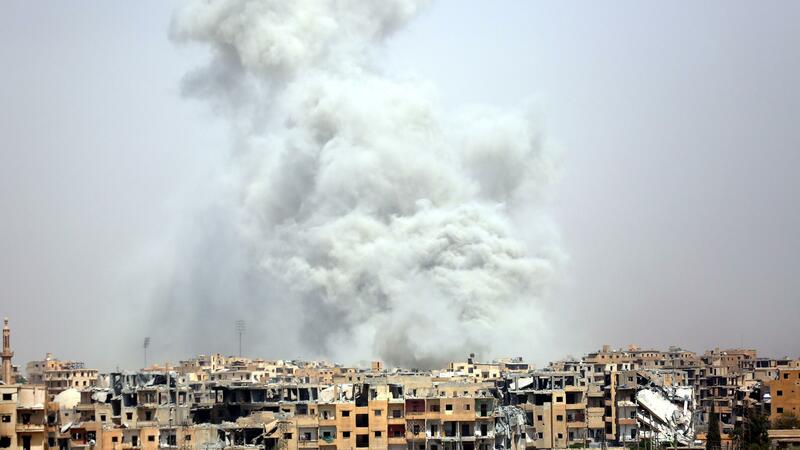 It would take another four months to pry Raqqa from ISIS control. During that brutal span, crossfire razed much of a metropolis that once held as many as half a million people. In a report released Tuesday, Amnesty International detailed some of the stories behind those days of destruction — and condemned the U.S.-led coalition for playing a significant role in them. "Coalition forces did not take adequate account of civilians present in the city and failed to take the precautions necessary to minimise harm to civilians and civilian objects," the human rights group concluded after an investigation that involved interviews with 112 witnesses and survivors. Airstrikes and artillery attacks launched by the coalition — and predominantly by U.S. forces — used imprecise, wide-area weapons on some sites where civilians lived and ISIS fighters rarely frequented, according to Amnesty. "Had Coalition forces conducted rigorous surveillance prior to the strikes," the group reported, "they would have been aware of [the civilians'] presence." The strikes "appear either disproportionate or indiscriminate or both and as such unlawful and potential war crimes," the group added later. In other words, the group said, too often the "war of annihilation" U.S. Defense Secretary James Mattis promised to wage against ISIS instead annihilated the civilians. 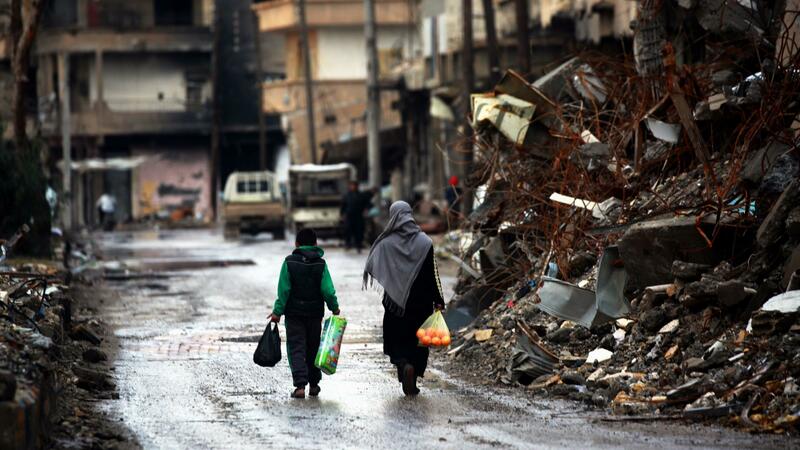 The accounts of four discrete families form the pillars of the report, and their stories paint a scene of despair for the civilians in Raqqa, both in those final months of war and now in their aftermath. Trapped by ISIS fighters, who blocked the city's exits with snipers and landmines, residents without the cash to pay smugglers were left to thread neighborhoods of rubble and hope — often fruitlessly — that they could elude death from above. "Those who stayed died and those who tried to run away died. We couldn't afford to pay the smugglers; we were trapped," said Munira Hashish, who had 18 members of her family die during that period — roughly half of whom were killed by ISIS, while the other half were killed by coalition fighters. She said she managed to escape with her children only "by walking over the blood of those who were blown up as they tried to flee ahead of us." But her brutal story is not the only one. Thirty-nine members of the Badran family and 10 of their neighbors were killed in coalition airstrikes, according to Amnesty, while the group says eight members of the Aswad family, including five children, died in a single airstrike in late June. Operation Inherent Resolve, the formal name for the coalition, acknowledged last November that its airstrikes and artillery had killed more than 800 civilians in Iraq and Syria since the operation began in 2014. That report, issued shortly after its victory in Raqqa, contradicted some other estimates, one of which placed the death toll just under 6,000. The latest monthly report from Operation Inherent Resolve estimates that coalition strikes unintentionally killed at least 892 civilians from April 2014 to April 2018; the monitoring group Airwars, for its part, says civilian deaths ranged north of 6,200 leading up to the start of this month. In its recent report, the mission described its role in the fighting as including "precision strikes preceded by a rigorous targeting process that aims at all times to minimize effects on non-combatant populations and civilian infrastructure." "We would welcome Amnesty International to witness the rigorous efforts and intelligence gathering the Coalition uses before any strike to effectively destroy Daesh [the Arabic acronym for ISIS] while minimizing harm on civilian population. They would see first-hand our enemy using civilian non-combatants as shields against the Coalition in order to sadistically claim that the Coalition is deliberately 'killing' civilians. Finally, they could see the painstaking efforts we make to assess allegations of civilian casualties." The statement asserted that "the Coalition sees any non-combatant death or injury as a tragedy" — and forcefully responded to many of the Amnesty report's principal allegations, point by point. In answer to Amnesty's claim of "disproportionate or indiscriminate" strikes, for one, the coalition said the human rights group failed to verify directly whether their processes meet "the requirements set out by international treaties and agreements regulating conduct in war, which they do." There was one remark from Amnesty that the coalition statement did not touch directly, however — and that concerned the state of Raqqa now, months after ISIS fighters largely fled. For those residents lucky enough to survive, life has resumed among the rubble, leftover improvised explosive devices and half-buried bodies — most of which they don't have the means to remove. Instead, they carry on. And according to Amnesty, they wonder. "Virtually every resident of Raqqa who spoke to Amnesty International asked why those who could spend so much for a costly military campaign to destroy the city cannot provide the relief so desperately needed in its aftermath, including the heavy-lifting equipment needed to clear the rubble and recover the bodies and clear the IEDs."